The Vita Mix Is An Investment In Your Health. If you haven't tried a Vita Mix, you're missing out. Whether you're on a raw food diet or not, whole raw foods are an essential part of health. You can eat a healthy raw food diet with nothing but a good knife, but when you can consume produce in delicious smoothies, slaws, dressings, soups, and even "ice cream", this diet gets a whole lot tastier. I put up with a ratty $30 Osterizer blender for years. It produced lumpy smoothies and constantly jammed when making slaws, soups, and blended salads. When I made my sports drink of bananas and celery, the celery would be left in chunks, and I'd find myself coughing up strands of the stuff when out on a run with the mixture in my water bottle. When I first tried a Vita Mix over a friend's house years ago, I couldn't believe the difference. It never gets jammed, it breaks up just about anything, and it produces smoothies that are actually smooth. You can craft delicious raw fruit ice cream with frozen fruit like bananas for special occasions, and really handle processing jobs like making raw slaws. The 2-HP motor ensures quick and smooth operation. I often make a smoothie for myself during the day, and make a healthy dressing for my salad at night, so having a good blender really pays off. Making a vegetable or fruit smoothie takes a minute or two - just put in some fresh fruit and/or vegetables and you have a nutritious, healthy meal that still contains all the vitamins and minerals the fruit started with. You won't have to deal with things getting jammed up, because between the strength of the blender and a plunger that pushes things into their path, nothing gets stuck. The Only Appliance You Need. I hate clutter. There's nothing more painful for me than bringing more of it into my home, and the thought of adding another appliance to my counter after giving away my toaster, microwave and rice maker upon going raw filled me with dread. But a good blender is well worth the counter space it takes up. If I could only have one appliance, it would be a Vita Mix. There's simply no tool I use and benefit from more. Slaws, smoothies, sauces, nut butters, the fillings for raw pies - this thing does just about everything. 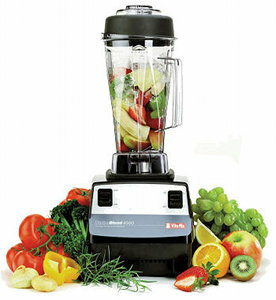 People email me asking about blenders for their raw food meals, and I've always steered them toward this blender. They universally tell me they love them. 1) The Eastman Tritan 64-oz container, which is big enough for any task, is extremely easy to clean and doesn't get filmy residue build up like my old blender. It is BPA free. 2) The 2-HP motor handles every job I put it to. 3) Get those critical greens in, even if you're not into salad, with delicious green smoothies. 5) Produces the best consistency of any blender I've used. Buy your Vita-Mix through Raw-Food-Health.net by clicking on the link below and get free standard ground shipping and a 30-day no risk in-home trial. My suggestion is to get a factory reconditioned model and save money. A Vita Mix makes the raw food lifestyle dramatically easier, and anything that lets you stick to fruits and vegetables is literally an investment in your health. Click Here To Get Yor Vita Mix and Receive Free Shipping.